This article is about the mode in New Super Mario Bros. 2. For Coin Rush in Toad Rally mode of Super Mario Run and the item that activates it, see Coin Rush Star. Mario running through World 6-A in Coin Rush mode. Coin Rush is a mode in New Super Mario Bros. 2. It can be played only as one player and can be unlocked by clearing either the Castle or the Cannon levels of the first world. In this mode, the player, as Mario or White Raccoon Mario, must race through three random courses without losing a life and while collecting as many coins as possible. The players still have access to all the coin-rewarding items from Solo Play mode, such as the Gold Block. Once players beat World 6- in the main game, they are given a Gold Flower in the Item Storage (unless White Raccoon Mario mode is chosen, in which case the Item Storage is empty), which can be used in only one of the three levels. By default, there are only one hundred seconds on the time limit allowed per course; some starts with less than 100 seconds such as World 1-1 (fifty seconds) and the third course in Coin Challenge Pack A (twenty seconds). The players can boost their time limit by collecting + Clocks and making it past Checkpoint Flags. As aforementioned, losing a single life ends the challenge, since the players cannot collect extra lives. Because of this, collecting one hundred coins does not affect the players' life count, and all 1-Up Mushrooms are replaced by Golden Mushrooms, which give fifty coins (one-hundred if collected by Gold Mario) each. Mario's remaining time is also converted into coins (one coin for every five remaining seconds). The third random course will always be a Tower or a Castle. There are three course packs, and more packs can be downloaded via paid downloadable content at the Nintendo eShop. The maximum number of coins that can be collected during Coin Rush is 30,000. Once that number is reached, no other coins that are collected are added to the counter. Coin Rush also features StreetPass functionality (see below), which allows Coin Rush players to challenge others' Coin Rush records. * - Order of Star/Moon Coins collected in a single level. * - The amount of coins earned from grabbing the Goal Pole as Gold Mario depends on the height Mario grabbed it (i.e. The higher the point which the pole is grabbed, the more coins he receives). Note: If Mario passes through a Goal Pole while under the effects of a Mega Mushroom, he receives three Golden Mushrooms. However, Mario's coin total cannot be multiplied with this maneuver. Mushroom Pack: Included in-game; randomly selects courses from Worlds 1, 2, and Mushroom. Flower Pack: Included in-game; randomly selects from Worlds 3, 4, and Flower. Star Pack: Included in-game; randomly selects from Worlds 5, 6, and Star. Although the courses are selected at random with each Coin Rush run, they are not completely random, as they will only appear based on which Coin Rush round the players are in. Additionally, courses from the main game are also picked in the order of one above-ground stage, one underground/underwater/Ghost House stage, and one tower/castle stage, respectively. Below is a list of which courses the players may get for each round. Note that each pack is staged in different difficulties, with the Mushroom Pack, the easiest pack, containing the courses from World 1, World 2, and World Mushroom, the Flower Pack, the middle pack, containing the courses from World 3, World 4, and World Flower, and the Star Pack, the hardest pack, containing the courses from World 5, World 6, and World Star. Note: World 3-B (due to the required use of the Mini Mushroom), World 6- , and World Star - (both due to the length of the Bowser/Dry Bowser battles) are never selected. This also applies to all the Rainbow courses, Cannon courses, and the Toad House "courses". Players are able to download additional course packs from the New Super Mario Bros. 2 shop. The shop is not accessible at first, but when SpotPass is activated and the device is played for a while, a notification on the downloadable content pops up in the home menu. When players read that notification, the Shop button appears once they open the game and select Coin Rush. Each level pack includes three courses that are played in a fixed order and not found in the actual game. The packs cost ￥200 in Japan, £2.00 in the UK, $3.00 in Australia and $2.50 in North America. Two to three course packs have been released at a time, and they can be bought individually or in a set with a combined price of the costs of each pack. Four sets of DLC packs have been released, with ten course packs having been released total; the Gold Classics Pack was not part of any set, being released in-between to celebrate three billion coins collected instead. The final set of course packs was released on December 20, 2012. Before December 20, 2012, the Coin Challenge Packs were the only Coin Rush packs to have leaderboards. A sky level similar to World 5-3. A level similar to World 5-A but in a beach area with jumping Cheep Cheeps. A tower level with gray Brick Blocks. A level similar to World Mushroom -1 with Fire Flower Pipes. A mountain level with platforms that go up or down when the player steps on them. A castle level in a volcano with Sledge Bros.
A level high in the sky, over a forest, with the entire layout being composed of Coins and Brick Blocks. A volcano level where the majority of the layout is composed of jumping on Paratroopas. A cannon level where the majority of the layout is composed of jumping on Bullet Bills. Notice that this first set of packs was available in North America on October 4th, 2012, two days after the pack released in Europe, Oceania, and Japan. A sky level with forest treetops. A mountain level with an icy ground. A cave level with mushroom platforms. A Ghost House with blue disappearing/reappearing blocks. A sky level with Bullet Bills and Banzai Bills. An outside volcano level with a castle foreground. From its release until January 31st, 2013, the Gold Classics Pack was free to download. A level based on World 1-1 and World 1-2 of Super Mario Bros.
A level based on World 1-1 and World 1-5 of Super Mario Bros. 3. A level based on the castle levels of Super Mario Bros. that also includes an altered version of New Super Mario Bros. 2's World 1-1. A beach level with tons of spikes and stars. 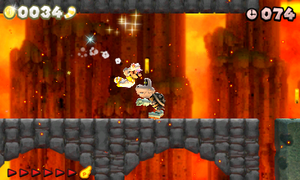 An underground desert level focusing on the Gold Flower. A volcano level with a down-going Spine Coaster ride. A jungle level with lots of Snake Blocks. A castle level with a Spine Coaster ride and many Bullet Bills. This is the last batch of packs for New Super Mario Bros. 2. Notice that this batch of these DLC packs was released in Japan and Oceania on December 21, 2012, a day after the release in North America and Europe. A level in a pyramid with multiple themes. A sky level with a Flying Question Block platform. A pipe-themed level with many Brick Block platforms, pipes, and Bob-ombs. An underwater level filled with Cheep Chomps, followed by a sky area with Lakitus, Crowbers, and a paddle wheel. A tower-themed level, where Flame Chomps and a lot of Fire Bars must be avoided. A castle with quickly-rising poison and jumping Grinders. Coin Rush also features a StreetPass functionality. Upon the completion of a Coin Rush session, the player is allowed to save a record of their run. This record will then be exchanged with other New Super Mario Bros. 2 players via StreetPass. Upon receiving another player's Coin Rush record, the receiving player may challenge the same three stages in the same order to earn more coins than the other player did. Players can only receive fifteen records at a time; if the player has fifteen records and receives more, then older records are deleted to make room. The number of coins needed to win is not revealed until the player finishes all three courses. Beating the received record earns the player a Crown Coin. Whether or not the record was beaten the first time, the other player's revealed record will add to the coin total the first time. In addition, each player may save only one of their own records at a time. This is the record that will be sent via StreetPass. Players may overwrite their previous record by either challenging their previous record on the same three stages, or by starting a brand new Coin Rush run. At the end, the player is given the choice to overwrite their previous record. However, if the record is from a DLC pack, the player that receives it but does not own the pack cannot challenge it until it is downloaded. This page was last edited on February 15, 2019, at 05:40.